Dr. Dent is a caring professional with your health as his personal priority. 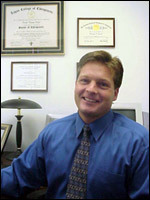 He is experienced in all forms of injuries, strains, and accidents and has patients in all different stages of therapy. He understands the needs of growing children, teenagers, adults and even senior adults wanting to get the most out of life. He cares for and treats pregnant women while relieving some of their discomfort and promoting long-term health. He specializes in athletic injuries, home and work related injuries, and chronic disorders of the spine and joints.